Every little girl dreams of being a princess, but we can’t all be Kate Middletons and Meghan Markle. But that doesn’t mean we can’t have a piece of their lavish lifestyle! Here are Pad Stylist’s 10 tips on how to create a dramatic, luxurious master bedroom that will allow you to sleep like the royals. Let’s take a look at what are the essential elements you need. Without a doubt, the main component in any bedroom, and the piece that will attract the most attention, is the bed. Not every bedroom will be able to accommodate a king-size bed, but that doesn’t mean you shouldn’t have a bed fit for a king! You can achieve that by opting for a bed frame that brings that dramatic element to the room. Something durable and elegant-looking, like a plush headboard, a dark-stained wooden one, or even a dark, gothic-inspired iron frame with a draped canopy. Nothing says royalty like a canopy, so don’t be afraid to make your princess dreams come true. Nothing gives a bed a more luxurious look or feeling than layering different types of bedding. 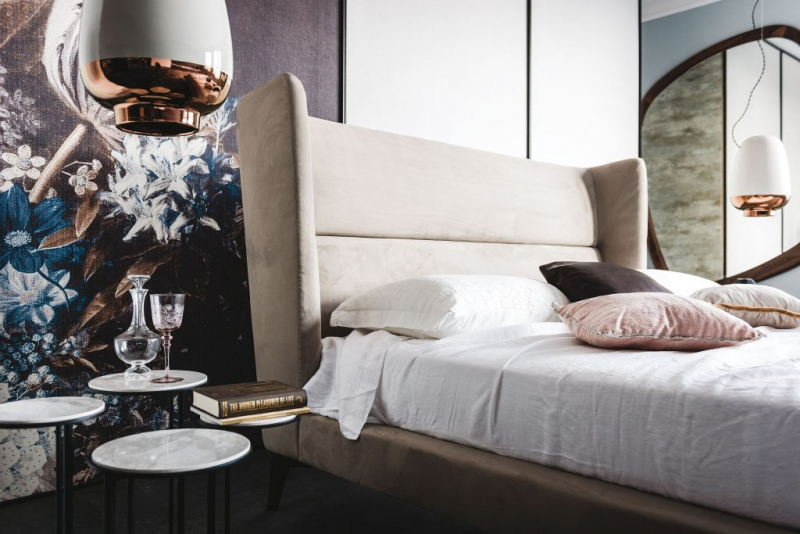 While just one layer can be perfectly fine and comfortable, it is a bit utilitarian, and if you want to sleep like the royals, then your bed is going to have to be a tad more decadent than that. This is where you’re allowed to be a bit OTT. Start with a set of sheets in a deep, rich colour such as dark navy or burgundy, and then on top start layering duvets and blankets in the same colour scheme, but different textures, in order to achieve a harmonious aesthetic. This will not only make sure your bed is nice and cosy, but it will also add visual interest. Extra tip: Play with satin, brocade, velvet, and faux fur for the ultimate royal look. Do you know what really brings a room together? The perfect rug. Choosing it is not only a question of colour scheme and aesthetic preferences, but also one of comfort. This is the first thing you will feel under your feet when you get out of bed in the morning, and you bet it should be warm, plushy, and comfortable. You can go for a statement bear-skin rug if the space can carry it, or for an otherwise more subdued style, if that’s too Game of Thrones for you, and less Royal Family. Think of your bedroom as your sanctuary – you retreat here to forget about the rest of the world and all of your worries. That’s why this room requires a calming colour scheme – nothing bright, dark, overly stimulating, or aggressive. Blue and beige are popular colours for bedrooms, thanks to their calming qualities. You can choose all the decorations in accordance with your colour scheme, so assuming you’ve chosen blue, you can go ahead and furnish the bedroom in varying relaxing hues of sky blue, navy, cobalt, and of course, royal blue. They will blend together harmoniously and give the room a very deliberate and rich feeling. Extra tip: Yellow is to be avoided, and so is red, as they are too energetically charged and can be overwhelming and distracting. And because this is your sanctuary, it should be a reflection of who you are, as a person, and what you enjoy and hold dear. That also goes for any artwork you choose to include. So, a beautiful picture of your favourite flowers, a seaside landscape, or an interesting abstract piece are all wonderful picks, but don’t make the mistake of adding photos of family – they are too emotionally charged and will not allow you to relax and calm down enough to have a satisfying night’s sleep. Save the pics of grandma for the family photo album. Surely, you’ve heard this before, but if there’s anything in this world you need to invest in, it’s a good mattress. Why? Because when you spend 1/3 of your life sleeping, you better make sure you’re comfortable and well-rested. Do you think Will and Kate sleep on lumpy mattresses with loose springs? No, they expect nothing less than a soft, flexible mattress that allows them to enjoy a relaxing royal slumber. If you want to rule the world, invest in your rest! Your bedroom is probably the place where you get ready in the morning, get dressed, put your makeup on, etc. That’s why it is vital for you to invest in a very good mirror – two, actually. You need one full-length mirror, so you can check your clothes; choose a massive one with a white or golden frame for that luxurious, decadent feel. Then, you need a quality vanity mirror. A round or hexagonal mirror is bang on trend, and it should be placed in a way that allows you to benefit from good lighting, preferably natural. We’re sure you realise how important your choice of lighting is in the bedroom, of all places – anything too bright or stark can be harsh and aggressive, especially combined with white walls, for example; that can give an almost clinical quality to a room. Soft lighting, like bedside lamps with carefully textured lampshades, or even candles, can create that soft-focus, dreamy effect you are after. And think of how good it’ll look with that canopy! Extra tip: Make sure to also invest in some thick, heavy blackout curtains in order to block any sort of light coming from outside, whether natural or artificial. You will notice a significant improvement in the quality of your sleep. The one thing that adds the most layers, texture, and visual interest to a bed are throw pillows, and you can take this as an opportunity to experiment with textures. Pillows with tassels, jewels, beads, patterns, lace, fur, velvet etc. can elevate the look of your bed and give it a truly royal look. And yes, there is such a thing as too many throw pillows – but the number depends on the size of your bed. For a standard queen-size or king-size bed, you should aim for 6 to 8 pillows, including decorative ones. Extra tip: The most comfortable, high-quality, and luxurious kind of pillows are down ones, so be sure to choose them, especially for the ones you sleep on. We hope the tips offered by us at Pad Stylist can give you an idea on how to recreate that lavish look for your personal royal bedroom. And if you ever need personalised advice on furniture placement, colour schemes, and anything in between, you can always book a free consultation with our designer assistants who are here to help you achieve your ultimate vision. Pad Stylist connects homeowners with interior designers - easily and affordably. To find more about them or to have them helping you create a Master Bedroom like the Royals's, please visit their website.